Egyptians are incensed after the country's military rulers select a person steeped in the country's old regime as prime minister. NEW YORK ( TheStreet) -- Egyptians are incensed after the country's military rulers selected a person steeped in the country's old regime as prime minister. Kamal el-Ganzouri, who was Egypt's prime minister from 1996-99 and deputy prime minister and planning minister before that, was picked by the country's military leaders to govern the country, according to state television. He served as prime minister under President Hosni Mubarak, who was ousted in February. An Egyptian riot police officer fires tear gas during clashes with protesters near Tahrir Square in Cairo earlier this week. "Not only was he prime minister under Mubarak, but also part of the old regime for a total of 18 years," protester Mohammed el-Fayoumi told The Associated Press. "Why did we have a revolution then?" The New York Times reported Friday that tens of thousands of demonstrators gathered in Cairo's Tahrir Square following a week of protests against the military's intention to retain power even after parliamentary elections begin Monday. 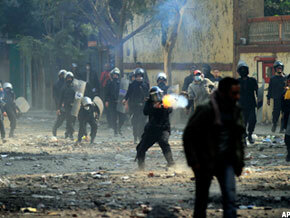 The White House continues to call for a civilian government for Egypt. "We believe that Egypt's transition to democracy must continue, with elections proceeding expeditiously, and all necessary measures taken to ensure security and prevent intimidation," the White House said in a statement. "Most importantly, we believe that the full transfer of power to a civilian government must take place in a just and inclusive manner that responds to the legitimate aspirations of the Egyptian people, as soon as possible."